Parkhouse Number Seven Main of the Clay Cross Company. This colliery was sunk in 1867 by the Clay Cross colliery company as their Number Seven colliery, closing in 1962 on October 12th. After ninety five years of production. The colliery originally employing 320 men and boys, 200 of which worked at the coal face. The colliery employed 420 men on closure. A Report to both Houses of Parliament. On this date at 10am. An explosion of gas took place resulting in the death of forty five men and boys. The colliery was working the Blackshale seam which was four feet six inches thick with two three inch thick dirt bands with a white sandstone floor with clay and stove. The system of coal getting was the longwall with stalls. Working lights were candles, naked lights were used throughout the mines except where gas was met and then safety lamps were issued. 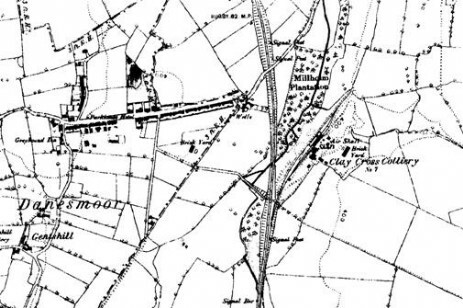 The mine was in an area where most of the collieries worked with candles on account of the comparative rare occurrence of gas and Parkhouse had the reputation of being one of the safest collieries in the district. The subsequent report on the disaster concluded that there had been no negligence by the Clay Cross company or its officials and in its findings it suggested, more and widespread use of safety lamps, more than one inspection for gas on each shift and better ventilation other than by a furnace.